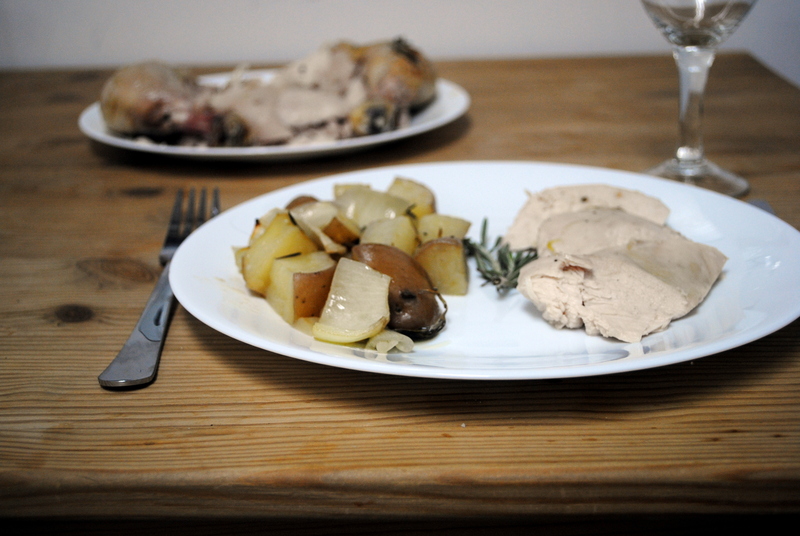 You don’t need me to tell you about the simple pleasures of roast chicken, or how economical it is to buy the whole chicken and cut up the parts yourself. 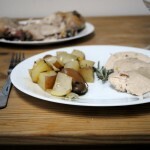 But I just made what was perhaps the best roast chicken of my roast chicken-making career, and I need to share. The secret is in the butter. 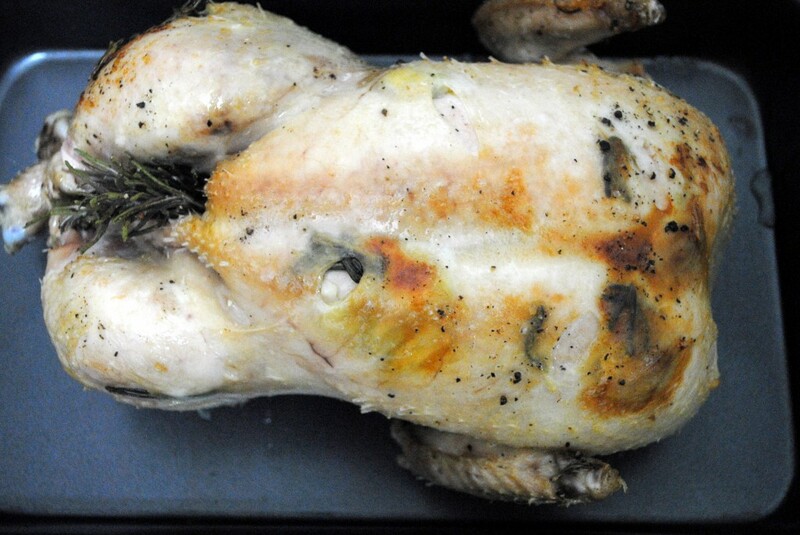 Put strategically placed pats of butter under the skin, then rub the whole chicken in butter. 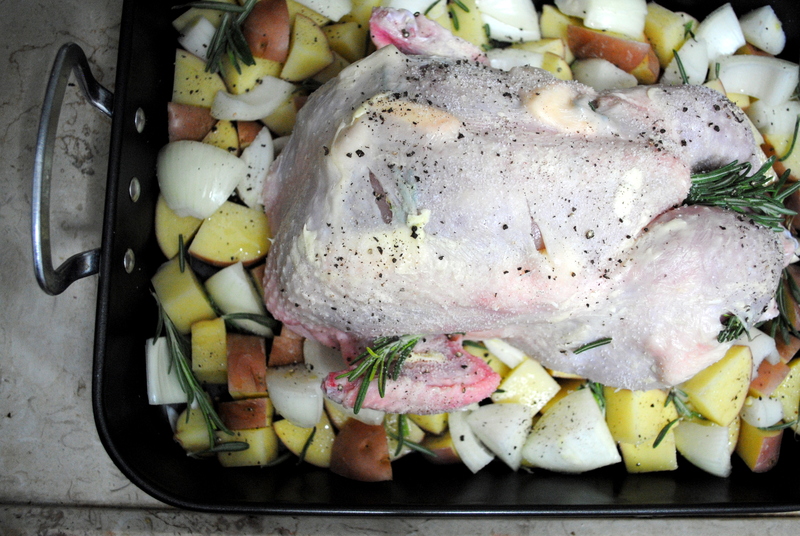 Get some garlic and herbs in there too, and roast alongside potatoes for a one pan meal that takes about an hour to make (depending on the size of the bird and the idiosyncrasies of then oven). The chicken came out perfectly crisp on the outside and ridiculously juicy and flavorful throughout. And the best part was that even after we got more than our fill for dinner, this meal kept on giving. The remaining potatoes were reheated the next morning to accompany fried eggs for a brunch-worthy breakfast. 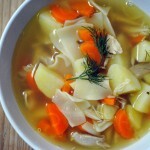 And the leftover chicken meat and carcass were thrown into a pot and made into enough soup for two more meals. 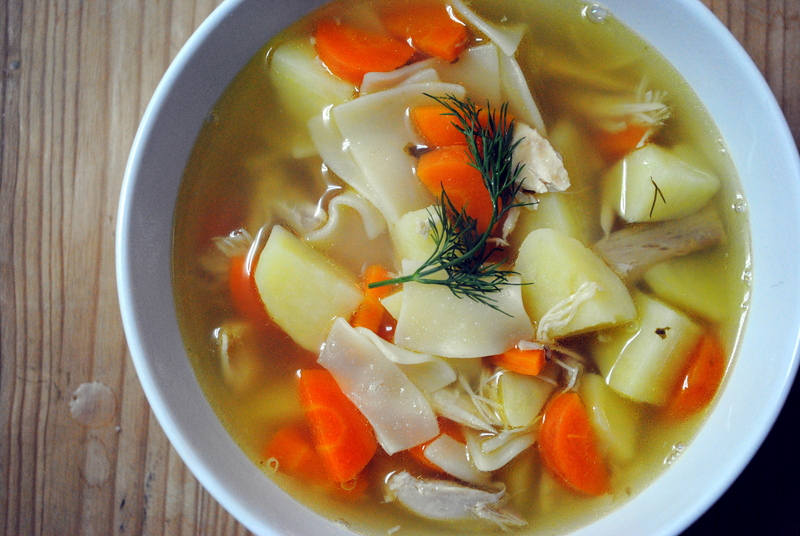 And there are countless other uses for leftover roast chicken (although making soup from scratch makes the most use of parts that would otherwise be discarded). Preheat the oven to 425F. Remove and discard the bag with chicken parts from the cavity, if there is one (or save for soup if you wish). Put the chicken in a roasting pan. Cut little slits in the skin and put pats of butter and pieces of garlic under the skin throughout the chicken; put a few rosemary needles under the skin as well. Put a few cloves of garlic and a little butter in the cavity of the chicken, then stuff with rosemary. Rub the entire chicken in butter then generously season with salt and pepper. Tie the legs together with butcher’s string and arrange the chicken so it is breast-side up. Sprinkle the potato and onion around the chicken; add carrots or any other root vegetable you like plus additional rosemary. Pour in just enough water that it comes up about 1-inch. Roast, undisturbed, for half an hour. Reduce the temperature to 375F and cook another 30 to 45 minutes until the inside of a leg can be cut open without pinkness or colored juice. Baste a few times as it cooks. 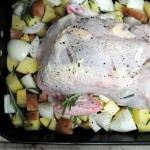 Remove from the oven and allow to rest for a few minutes before carving. Use this recipe as a base and adjust based on preferences and what you have on hand. Any number of herbs can be used instead of or in addition to the rosemary. Use more or less garlic, herbs, and butter based on the size of the bird and again personal preference. Substitute turkey and cook for much longer, or Cornish game hens and cook less. And cooking times can vary dramatically so keep a nose out (you’ll smell when it’s done).